— I Have Ball Of Foot Pain! Why Does This Keep Occurring? You have been suffering from ball of foot pain for the past few months, which has resulted in a sudden reduction in your physical activity. You have found that when weight-bearing you experience a greater amount of pain compared to periods of rest. Metatarsalgia is a condition which affects the ball of your feet resulting in pain and inflammation. To determine the exact cause of the pain you are experiencing, medical imaging is required to provide a diagnosis. The three main conditions that will fall under the bracket of Metatarsalgia include conditions such as Morton’s Neuroma, Inter-digital Bursitis and Sesamoiditis. A Morton’s neuroma is typically characterized by pain experienced within the 3rd and 4th web-spaces, in which you may feel like you are standing on pebbles. Quite often there is a thickening of the tissues that surround the nerves, resulting in pain. The symptoms that are associated with a Morton’s neuroma will include a sharp, burning sensation which can result in the toes feeling numb. More often than not those who develop a neuroma will do some from irritation, injury or pressure to the nerves. A bursitis occurs due to inflammation of the bursa, which contains small fluid filled sacs. They typically occur between two structures such as muscles, tendons and bones. You may experience pain and a restriction in movements as Bursitis can cause pain and restrict movements due to inflammation. Quite often shoulders, hip, knee and heel are the most common locations. Located at the bottom of your 1st big toe joint are two small bones about the size of peas which are connected to the flexor tendons. 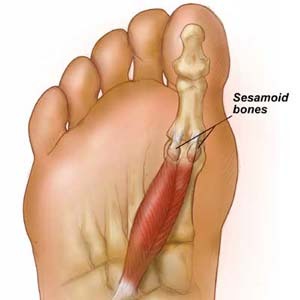 The sesamoids function as a pulley to allow movement within the big toe joint. Pain is often experienced at this location due to injury from activities such as Ballet, catchers in baseball/ softball or running. In some cases the tendons surrounding the bones will become inflamed or the sesamoid bones may be fractured. When a fracture occurs typically swelling and pain experienced will occur behind the big toe with a sudden onset.